This time last week, I wouldn’t have thought there would be an FO Friday this week. However, last Sunday night I picked up my Coastal Crochet CAL blanket and finally started on the border. I’ve only been putting it off since September! The thought had been really daunting, knowing that there were so many stitches to make and also I had no idea what kind of border to make. 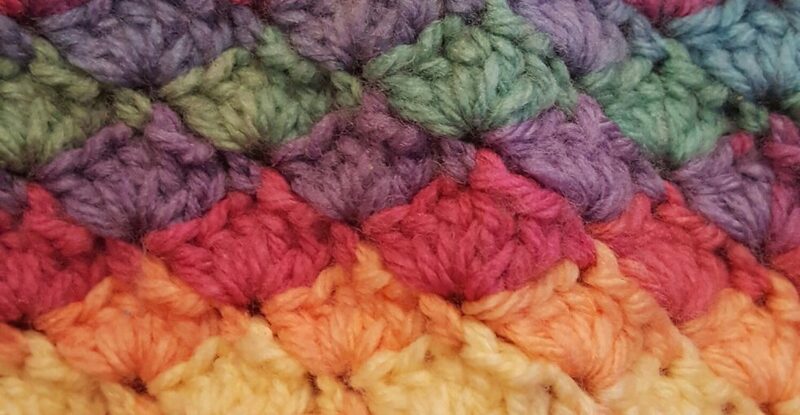 In the end I settled for a simple double crochet border, using the colours which I had the most of left over from the blanket. Before I could even start the mammoth task of making the first round, I had to establish which hook size I had used for the blanket. Yes, really, it had been that long since I worked on it. Thank goodness for Instagram, and the photos I had taken of the blanket when I was working on it, complete with hook! It took ages to complete a round, and I had to do it in three sittings as it was a bit much on my arm, which was still a bit achy. (It’s much better now, fortunately!) I didn’t really know how many rounds to make, but it looked ok after three so I left it at that. I felt it only needed a simple border because the blanket itself is so beautifully patterned. I do like a fancy border, on the right blanket, but this one didn’t call for any fuss or frills, it just needed neatening up a bit. I’m happy that it’s finished-it was a lovely project to make and now there’s a gap in my crochet basket. I might have to work on filling it now! Have you finished anything this week? Do you ever put off ‘tricky bits’ for far too long? It looks great! I always love that feeling of finishing a big project! It’s a good feeling isn’t it, I think the blanket may come camping with us next time we go! Oh that would be an awesome addition to a camping trip! Well done! This has turned out beautifully. Love the colour choices and agree a busy border would have been too much. Haha, sounds just like me! I always put off the tricky bits! It always feels great to get past the tricky bits and finish something though. Well done! Looks beautiful! Wow! What a beautiful blanket! The border is perfect for all of those wonderful stitches. Congratulations on the finish. I have been putting off finishing the Spicier Life blanket for so long. I know I want to finish it, but I get so frustrated with all of the stitches and trying to keep my edges straight. I’ll get back to it one day. I know that you are happy to finish your blanket. Admire your finished beauty a bit before starting your next project. Thank you, I know what you mean about edges, my blanket needed some ‘adjustments’ ! But the main thing is that we do eventually get it done, right?